Distinguished guest pianist William Ransom joins the Amernet String Quartet in the intimate Miami Beach Urban Studios. The program will include selections for String Quartet No. 10 by Schubert, String Quartet No. 8 by Shostakovich, and Piano Quintet No. 1 by Dohnányi. The concert is free, and no ticket is required. 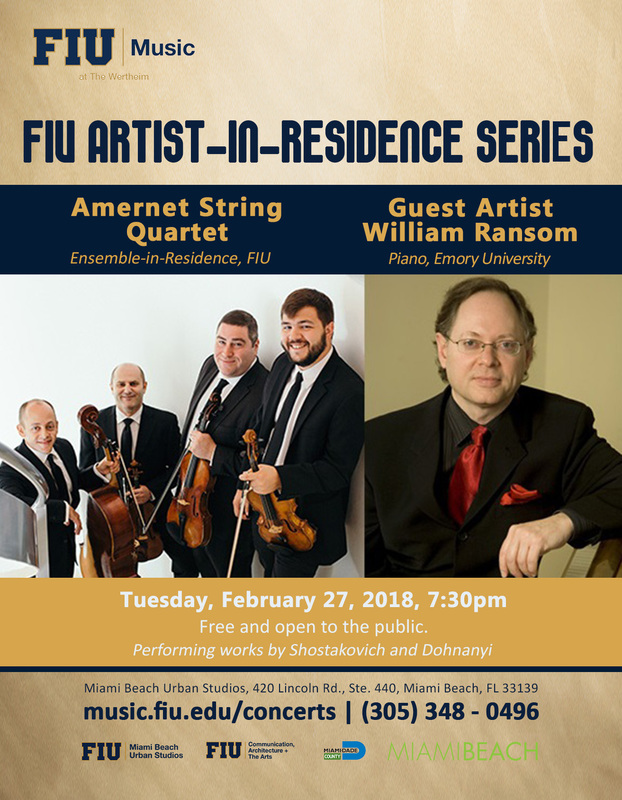 The Amernet String Quartet has garnered recognition as one of today’s exceptional string quartets and are Artists-in-Residence at Florida International University in Miami. Their sound has been called “complex” but with an “old world flavor.” Strad Magazine described the Amernet as “…a group of exceptional technical ability.” The Amernet’s performance schedule has taken the quartet across the Americas and to Asia, Europe, and the Middle East and they have collaborated with many of today’s most prominent artists and ensembles including the Tokyo and Ying quartets as well as Shmuel Ashkenasi, Robert deMaine, Roberto Diaz, Alexander Fiterstein, Gary Hoffman, Anthony McGill, Sherrill Milnes, and Michael Tree. Internationally, the quartet has appeared at major festivals around the world, including Cervantino, San Miguel de Allende, Aviv (Israel), and Colima (Mexico), while the Nürnberger Nachrichten commented that their playing was “fascinating, with flawless intonation, extraordinary beauty of sound, virtuosic brilliance, and homogeneity of ensemble.” The Amernet’s U.S. engagements have included the Kennedy Center, the Tilles Center, Caramoor, the Great Lakes Festival, Newport, Friends of Chamber Music in Arizona and in Syracuse, LPR in New York City, Chamber Music Society of Louisville, Music on the Edge in Pittsburgh, the University of Maine – Collins Center, and Market Square Concerts. The Amernet has also appeared as quartet soloist with the Cincinnati Symphony and Alan Gilbert. Earlier in their career, the Amernet won the gold medal at the Tokyo International Music Competition before being named first prize winners of the Banff International String Quartet Competition. Prior to their current position, the Amernet held posts as Corbett String Quartet-in-Residence at Northern Kentucky University and at the University of Cincinnati College-Conservatory of Music. Additionally, the ensemble served as the Ernst Stiefel Quartet-in-Residence at the Caramoor Center for the Arts. In its frequent touring, the Amernet has conducted workshops and master classes in Buffalo, Los Angeles, Memphis, and New Orleans as well as visiting residencies at colleges and universities including Columbia, Dickinson, Fresno State, Gettysburg, Penn State, Princeton, Western Illinois, and Williams and abroad in Colombia, Israel, Mexico, and Serbia.  The Amernet String Quartet has received grants from the Corbett Foundation, the Greater Cincinnati Foundation, the LaSalle Foundation, the Fine Arts Fund, the Cincinnati Chamber Music Society, and the Amernet Society for school outreach projects, the commissioning of new works, and their concert and conversation series. The Amernet advocates for a broad repertoire, playing the classical literature; the music of Jewish composers; and of course the music of our time, and has worked closely with some of today’s leading composers, including John Corigliano, Orlando Garcia, John Harbison, Toshi Ichiyanagi, Fredrick Kaufman, Bernard Rands, Augusta Read Thomas, Morton Subotnick, Dmitri Tymoczko, and Chinary Ung. Visit www.amernetquartet.com for all the latest news. Pianist William Ransom has appeared in recital, as soloist with orchestras, and as a chamber musician in Eastern and Western Europe, Japan, Korea, South America, Mexico, and throughout the United States. He has performed in New York’s Weill Hall at Carnegie Hall, Alice Tully Hall, Town Hall, and Merkin Hall; in Orchestra Halls in Chicago, Detroit, and Atlanta; at the National Gallery in Washington D.C.; and in Philadelphia, Boston, Miami, Dallas, and Los Angeles. He has performed for the American Ambassadors to Japan and Ireland, and his performances have been broadcast on National Public Radio and Television in the United States, Japan, Korea, Argentina, and Poland. His recording of Enoch Arden, by Richard Strauss, The Music of Alfredo Barili, and Chamber Music of Johannes Brahms were released on the ACA label. Ransom can also be heard on Heartkeys, from Rising Star Records. Ransom has commissioned and premiered several major works by composer Stephen Paulus, and he was also the featured pianist performing music by Dwight Andrews used in August Wilson’s Pulitzer Prize winning Broadway hit, The Piano Lesson, as well as the Hallmark Hall of Fame movie based on the same play. A popular performer on many University concert series, he has performed at numerous colleges around the country including Yale, Cornell, Duke, Tulane, Vanderbilt, M.I.T., and Stanford, where he has also given master classes.